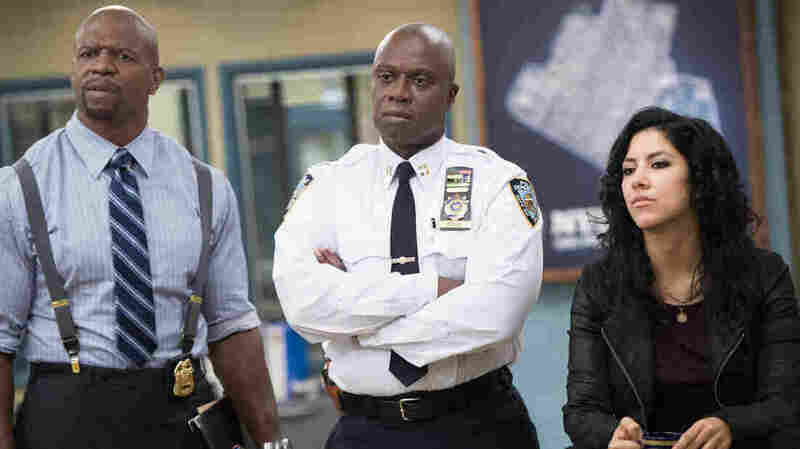 'Brooklyn Nine-Nine' Hits A Home Run With The Stupendous Andre Braugher Sunday night's Brooklyn Nine-Nine gave star Andre Braugher a moment of pure comedic joy-genius. Sgt. Jeffords (Terry Crews, L), Capt. Holt (Andre Braugher, C) and Det. Diaz (Stephanie Beatriz, R) try and figure out why Amy is late in Sunday night's Brooklyn Nine-Nine. The Fox comedy Brooklyn Nine-Nine was a tiny bit uneven in its first few episodes last year, but it was always clear that it had the goods. Since then, it's become one of the most reliably funny, sharp, and — in the tradition of shows like Parks & Recreation, which creators Michael Schur and Dan Goor also worked on — big-hearted comedies in prime time. One of its primary weapons is the sublime Andre Braugher, a well-known dramatic actor who has turned out to be a comedy gem; the interplay between the steely, unsmiling Braugher and goofy try-hard Andy Samberg has brought out great things in both of them. In Sunday night's cold open, the rest of the squad has gathered to speculate about why straight-arrow Amy Santiago (Melissa Fumero) is, for once, late to work. Cast members Braugher, Samberg, Fumero, Joe Lo Truglio, Terry Crews, Stephanie Beatriz and Chelsea Peretti absolutely kill it in this little bit that concludes with one of the best, most surprising kickers I've ever seen in a piece like this.